It’s generally easier to move something than to make something. 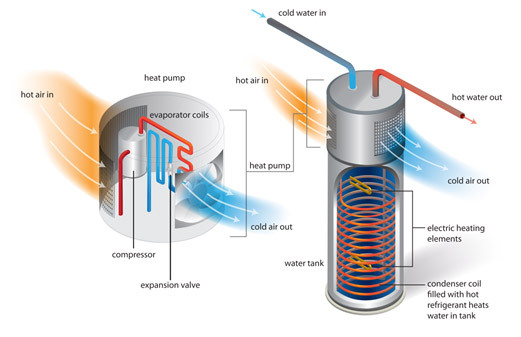 Putting that principle to use, heat pump water heater (HPWH) technology uses electricity to move heat from one place to another instead of generating heat directly. A low-pressure liquid refrigerant is vaporized in the heat pump’s evaporator and passed into the compressor. As the pressure of the refrigerant increases, so does its temperature. The heated refrigerant runs through a condenser coil within the storage tank, transferring heat to the water stored there. As the refrigerant delivers its heat to the water, it cools and condenses, and then passes through an expansion valve where the pressure is reduced and the cycle starts over. ENERGY STAR qualified heat pump water heaters are revolutionizing the way we heat water. New products recently introduced utilizing super-efficient technology that can cut water heating costs by more than half! If you have time to plan ahead, consider this exciting new technology for your next water heater purchase. Covers high-efficiency gas storage, gas condensing, whole-home gas tankless, solar, and heat pump water heaters. Products must meet minimum requirements for energy efficiency, hot water delivery, warranty period, and safety. ENERGY STAR qualified heat pump water heaters are more than twice as efficient as standard electric models. By choosing an ENERGY STAR qualified heat pump water heater, you can cut your water heating costs in half!